The world’s largest island country is also known for its very vast biodiversity. Flower industry is very well flourished in Indonesia due to the expense associated with flowers and arrangements. Indonesians like to give gift flowers on various occasions like birthdays, anniversaries, mother’s day, Christmas etc. Jakarta, Bandung, Surayabaya, Yogyakarta are some popular cities in Indonesia where flowers are sent in abundance. Bunga Papan, or board flowers (flower arrangements) are best choices for wedding & anniversaries. Send flowers same day to Indonesia using our local florists & flower shops. Order by 12 noon. Send Easter Flower Arrangement, Easter Hampers & Gift Baskets to Indonesia. Send Roses, Carnations, Lilies throughout Indonesia for occasions like Birthdays, Anniversaries, Funerals, etc. Enjoy affordable flower delivery across Jakarta, Surabaya, Bandung, Bekasi & nationwide delivery. How do i send International Flower Delivery to Indonesia? 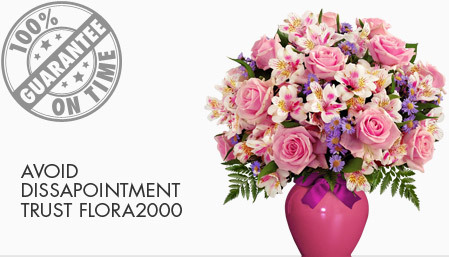 Flora2000 has transformed International flower delivery to Indonesia into a fine and effortless art. With our efficient flowers & gifs delivery services worldwide; you are sure to find the perfect expression of your message to your loved ones. Be it Roses, Lilies, Carnations or Cakes, our gifts are sure to make both the sender and the receiver happy. We make sure the gifts you give reflects what you feel about the receiver. Indonesia is the world’s largest island country. It is also known for its very vast biodiversity. Flower industry is very well flourished in Indonesia due to the expense associated with flowers and arrangements. Indonesians like to give gifts on various occasions like birthdays, anniversaries, mother’s day, Christmas etc. Jakarta, bandung, Surayabaya, Yogyakarta are some the popular cities in Indonesia. Bunga papan, or board flowers (flower arrangements) are best choices for wedding & anniversaries. Modest but thoughtful gifts are always welcomed in this nation. In Indonesia, songbirds are prized pets. Music of champion songbirds are well-liked here and make good choices of gifts for those who have affection for birds. We have an exclusive collection of flower arrangements, hampers & baskets for this Easter. Our classy collection of flowers & Gifts for Easter to Indonesia.